A seaweed (Laurencia) up close. The "branches" are multicellular and only about one millimeter thick. Much smaller algae are seen attached to the structure extending upwards in the lower right quarter. Seaweeds are macroscopic, multicellular, marine algae. They are generally benthic, being anchored to the bottom of the ocean or to solid structures. Algae (singular alga), a name derived from the Latin word for seaweed, are a large and diverse group of photosynthetic, eukaryotic, plant-like organisms that use chlorophyll in capturing light energy, but lack characteristic plant structures such as leaves, roots, flowers, vascular tissue, and seeds. Although they have historically been regarded as simple plants, they are generally classified in the kingdom Protista, rather than Plantae. Although algae range from single-celled organisms to multicellular organisms, if they are both multicellular and marine, and are easily seen by the naked eye, they are generally called seaweeds. Single-celled or few-celled organisms are not usually called seaweeds. Seaweeds themselves have many forms, including those that appear as if they are terrestrial plants with leaves and stems, looking like moss, mushrooms, leaf lettuce, or even a palm tree. Some are quite large: the multicellular giant kelp reaches 60 meters in length. Various seaweeds serve as a habitat and food for other sea creatures. For humans, seaweed also can be used as food and as fertilizer. Red algae are a source of agar, a gelatinous polysaccharide that is used as a culture medium for microbiological work, as well as vegetarian gelatin substitute, a thickener for soups, in jellies, ice cream, and so forth. Rather than a specific taxa, seaweed can be one of several types of algae: brown algae, red algae, or green algae. Most of the seaweeds of the warm oceans are red algae. They absorb the deep penetrating blue light, allowing them to exist deeper than other algae. The brown algae include the major seaweeds found on the shores in the temperate zones and the large, offshore beds of kelps. There are few green algae that are seaweeds, but one is the sea lettuce. Seaweeds are classified into brown algae (Phaeophyta), red algae (Rhodophyta), and green algae (Chlorophyta). Note that in reality the term algae is mainly used for convenience, rather than taxonomic purposes, as there appears little relationship between the various phyla. Seaweeds are often confused with other photosynthetic organisms. Seaweeds are popularly described as plants, but biologists typically do not consider them true Plantae. They also should not be confused with seagrasses, which are vascular plants. In addition, a few species of cyanobacteria bear a resemblance to seaweed algae. Some biologists prefer the term "marine macroalgae" over "seaweeds." The Phaeophyta, or brown algae (Class Phaeophyceae, Division Heterokontophyta or Phaeophyta, Kingdom Protista or Plantae or Chromalveolata), are a large group of multicellular, mostly marine algae, and include many seaweeds of colder Northern Hemisphere waters. One example of brown algae seaweed is Sargassum, which creates unique habitats in the tropical waters of the Sargasso Sea. This is one of the few areas where a large biomass of brown algae may be found in tropical waters. Kelp are large seaweeds belonging to the brown algae and are classified in the order Laminariales. There are about 30 different genera. Kelp grows in underwater forests (kelp forests) in clear, shallow oceans. They require nutrient rich water below about 20 °C. Kelp is known for its high growth rate and is the largest seaweed. Macrocystis, a member of the Laminariales, may reach 60 meters in length and grows up to 30 centimeters per day. The red algae (Phylum Rhodophyta, from Greek rhodon = rose + phyton = plant, thus red plant) are a large group of mostly multicellular, marine algae, including many notable seaweeds. Red algae are a traditional part of European and Asian cuisine and are used to make other products like agar, carrageenans, and other food additives. The Chlorophyta, or green algae (Division Chlorophyta), include about eight thousand species of mostly aquatic organisms. Like the land plants (Bryophyta and Tracheophyta), green algae contain chlorophylls a and b, and store food as starch in their plastids. They contain both unicellular and multicellular species. While most species live in freshwater habitats, and a large number in marine habitats, other species are adapted to a wide range of environments. Few are actually seaweeds, however, either because they are freshwater or microscopic. The sea lettuces (genus genus) are a notable exception. holdfast: specialized basal structure providing attachment to a surface, often a rock or another alga. The stipe and blade are collectively known as fronds. Some seaweeds have gas in the fronds that help them to be buoyant and float at or near the surface. Seaweed serves a number of ecological, commercial, and medical uses. For example, seaweed offers protection to some sea creatures and food for others. 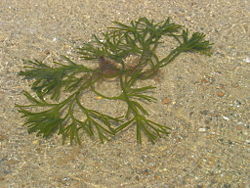 Some seaweeds are used as fertilizer. Through the nineteenth century, the word "kelp" was closely associated with seaweeds that could be burned to obtain soda ash (primarily sodium carbonate). Soda ash is used in the manufacture of glass, pulp and paper, detergents, and some chemicals. It is used as an alkaline agent in many chemical industries, and used as a water softener for laundry, among other uses. The seaweeds used in obtaining soda ash included species from both the orders Laminariales and Fucales. The word "kelp" was also used directly to refer to these processed ashes (OED 1989). Seaweeds are extensively used as food by coastal peoples, particularly in Japan and Korea, but also in China, Vietnam, Indonesia, Peru, Taiwan, the Canadian Maritimes, Scandinavia, Ireland, Wales, Philippines, and Scotland, among other places. For example, Porphyra is a red alga used in Wales to make laverbread. In Japan, dried seaweed, formed into sheets called nori, is widely used in soups, and for wrapping sushi, boiled rice stuffed with bits of raw fish, sea urchin roe, or other ingredients. 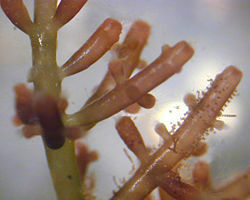 Chondrus crispus (commonly known as Irish moss or carrageen moss) is another red alga used in producing various food additives, along with Kappaphycus and various gigartinoid seaweeds. Seaweeds are also harvested or cultivated for the extraction of alginate, agar, and carrageenan, gelatinous substances collectively known as hydrocolloids or phycocolloids. Hydrocolloids have attained commercial significance, especially in food production, with the food industry utilizing the gelling, water-retention, emulsifying, and other physical properties of these hydrocolloids. Agar is used in foods such as confectionery, meat and poultry products, desserts and beverages, and molded foods. Carrageenan is used in preparation of salad dressings and sauces, dietetic foods, and as a preservative in meat and fish products, dairy items, and baked goods. Alginates enjoy many of the same uses as carrageenan, but are also used in production of industrial products such as paper coatings, adhesives, dyes, gels, explosives, and in processes such as paper sizing, textile printing, hydro-mulching, and drilling. In the biomedicine and pharmaceutical industries, alginates are used in wound dressings and production of dental molds, and have a host of other applications. In microbiology research, agar is extensively used as culture medium for bacteria. Carrageenans, alginates, and agaroses (the latter are prepared from agar by purification), together with other lesser-known macroalgal polysaccharides, also have several biological activities or applications in biomedicine. A number of research studies have been conducted to investigate claims of seaweed's effects on human health. It has been asserted that seaweeds may have curative properties for a number of aliments. However, Guiry (2006) notes that many of the reported medicinal effects have not been substantiated. He does recognize, however, that Corallina is being used in bone-replacement therapy, some kelps have polysaccharides that apparently correlate with reduction in the occurrence of breast cancer, and some seaweeds, such as Sargassum, are used in Chinese medicine, including for treatment of cancer. Guiry, M. 2006. Seaweed: Medicinal Uses. Retrieved August 27, 2007. Lewis, J. R. 1964. The Ecology of Rocky Shores. The English Universities Press Ltd.
Oxford English Dictionary (OED). 2006. “Kelp,” In Oxford English Dictionary, 2nd online edition. Oxford University Press. Round F. E. 1962. The Biology of the Algae. Edward Arnold Ltd.
Smith, G. M. 1944. Marine Algae of the Monterey Peninsula, California, 2nd edition. Stanford Univ. This page was last modified on 26 August 2015, at 16:14.